Nathan and his Father, David, joined us for a really tough weekend on the Little Red River. The river is still high and we had to battle winds to 40mph. These two college professors of political science from Indiana really worked hard and released a bunch of fat Rainbows along with is beautiful “slot limit” Brown Trout which Nathan took on a #12 March Brown emerged pattern. Bo really enjoyed the political discussions with these two teachers; but I enjoyed watching them catch and release all those trout! Greers Ferry lake should be back below the conservation pool later this week and hopefully the generation will be reduced and maybe we will see the winds of the last month also subside. 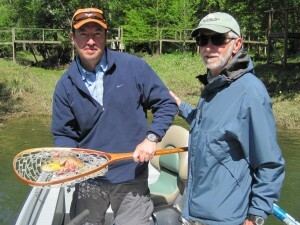 With that we should also see the fly fishing improve.